In the 1600’s, European fashion demanded furs. The native Indians eagerly engaged in trade with New France in exchange for goods that transformed their lives. Little Eau Pleine trappers traded under the flags of three nations: France (1650 to 1763), England (1763 to 1816), and the United States (1816 to 1850). 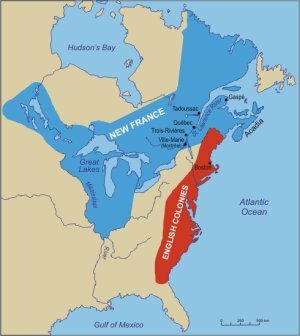 New France and English Colonies in 1650. New France dominated the fur trade until they were defeated by the British in 1763. 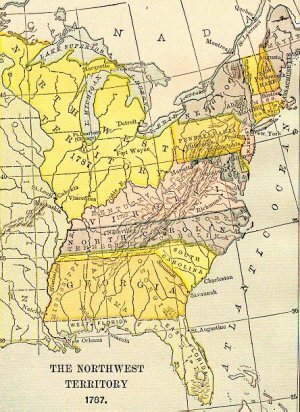 British and American Fur Trade in the late 1700’s – The Northwest Territory was established by the Continental Congress in 1787. In spite of American ownership, the English dominated trade until the War of 1812. Metis (mixed French and Ojibwe) traders worked for the British North West and XY Companies and later the American Fur Company of John Jacob Astor. The beaver felt hat was a fashion necessity in Europe for over 200 years. 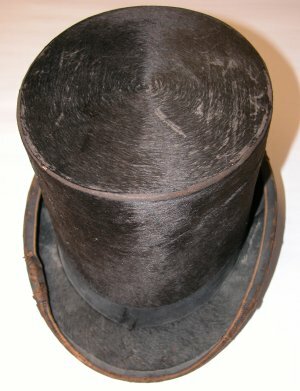 The fur trade ended in 1850 when silk hats became the fashion rage. The following trade goods were found two miles from here on the north side of the Little Eau Pleine River. This was the likely site of a “wintering” post. In 1800 the North West Company operated 117 trading posts. The earliest record of traders on the Little Eau Pleine is of Louis DuBay, a Metis “winterer” with the North West Company who spent the winter of 1790 here with the Ojibwe. In 1832 his son, Jean Baptise DuBay, operated an American Fur Company post where the Little Eau Pleine empties into the Wisconsin River. Lake DuBay is named for him. Look for the French touch mark on the hammer poll axe on the right. 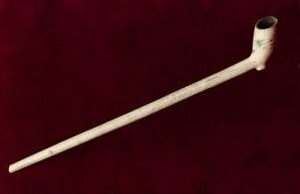 This mark identifies it as a New France trade item made before England defeated France in the French and Indian Wars in 1760. 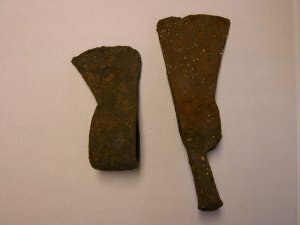 The axe at left is typical of the 18th century. 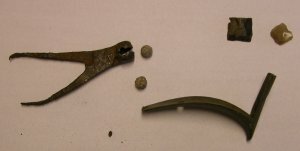 These rusted parts are from a Northwest Trade Gun, probably from the late 1700’s. 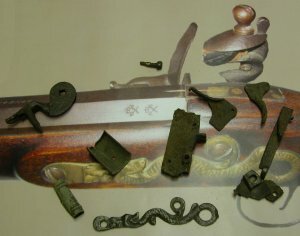 These guns, with their brass serpent side plate, were highly prized as both a fowling piece and as a rifle. They were mass produced in England and other countries for the fur trade. (label on flints) The black gunflint is British and the brown gunflint is French. (label on bullet mold) Bullet mold and lead bullets. 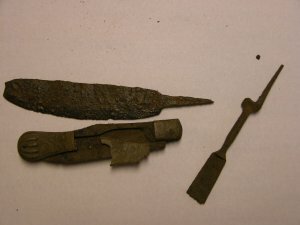 A trade knife, middle an English clasping knife, right, a two-tined fork, all from the late 1700’s. Knives and axes were traded without handles which the Indian trappers made themselves. Glass trade beads, made in Venice, and trade silver were highly prized by the Indians. 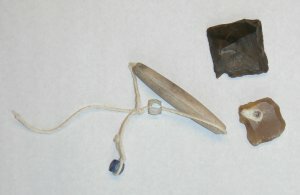 These faceted beads, silver broach and kaolin breast plate piece were found at the Little Eau Pleine trading post site. Iroquois beaded moccasins from the Cadotte family, ca. 1850--- French fur traders usually married Ojibwe women.. For more than one hundred years these Metis (mixed blood) families ran the trading posts. Michel Cadotte, a Metis, had his main Northwest Fur Company post on Madeline Island in Lake Superior and had “wintering” posts throughout northern Wisconsin. The town of Cadott is named for the post that he established there in 1787. 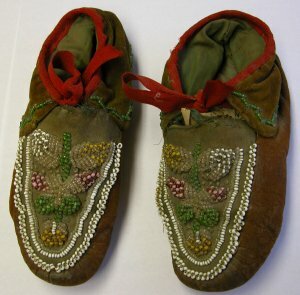 These Moccasins may have been traded from the Eastern U.S. and ended up with the Cadotte family in Wisconsin. Powder horn and measure from the 19th century. 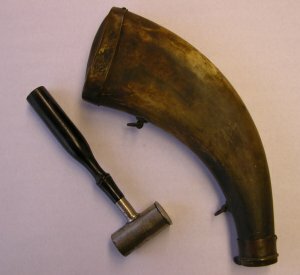 The horn was found within the walls of an old tavern in Mosinee. 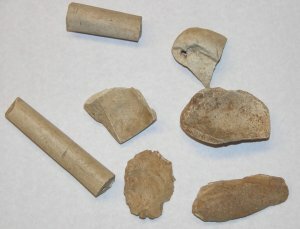 Clay pipe stem and bowl pieces found on the Mead Wildlife Area.